Florence Lee Hardy, daughter of the late William and Sarah Hardy departed her life at her home on March 18, 2019 surrounded by family and friends. She was born August 14, 1949 in Nottoway County. Florence attended Nottoway County public schools. She accepted the Lord Jesus Christ as her personal Savior at an early age. Later she joined New Poplar Mount Baptist Church and was baptized by Reverend Nathaniel Tucker. She worked faithfully in the church as an usher and in the kitchen until her health started to fail. Florence worked many jobs, Levi Strauss, Craddock Terry and Fort Pickett until she retired because of her health. 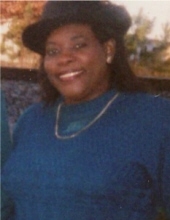 Florence was preceded in death by a brother, William Hardy Jr., but leaves to cherish her memory: two loving and faithful children, Frieda Peebles and son-in-law Michael of Emporia, VA and Kevin Hardy (Senethia) of Richmond, VA; two beautiful grandchildren, Michael Peebles Jr. of Emporia, VA and Yesenia Hardy of Richmond, VA; seven sisters, three devoted, Sallie Washington (Wayne) of Blackstone, VA, Bertha Hardy, Annette Johnson of Blackstone, VA, Hazel Fields (Charles), Donna Mason (Derek) of Blackstone, VA, Patricia Clark and Rosa Davis of Blackstone, VA; three brothers, her twin, Lawrence Hardy, Paul Hardy (Beverly) of Blackstone, VA and Earl Hardy (Wilma) of Amelia, VA; four devoted nieces, LaWanda Fowlkes, Christina Fields, Lori Coleman, all of Blackstone, VA and Kimberly Mason of Hopewell, VA; a host of nieces and nephews, DeShawn, Shawn, Carlton, Ellis, Shelley, Bernard, Dominique, Lionel, Lionell, Shaquan, Marelle, RoKeisha, Chavon, Tomeria, Paul Jr., LaToya, Sarah, Gary, Theresa, Marvin, Sharon, Angie and Marvin; great nieces and nephews, cousins and friends; devoted friend of thirty years and caregiver, William Bragg; longtime friend Patricia Greenhill; a devoted cousin, Sallie Hardy Grop of Cleveland, OH. Funeral Services Saturday, March 24, 2019 at 1:00 p.m. at New Poplar Mount Baptist Church, Nottoway. Interment church cemetery. To plant a tree in memory of Florence L. Hardy, please visit our Tribute Store. "Email Address" would like to share the life celebration of Florence L. Hardy. Click on the "link" to go to share a favorite memory or leave a condolence message for the family.